Note: Football record books spell his surname as Pinnell, as does the 1891 census. However, earlier censuses and other official records, earlier and later, spell it differently - either Pennal, Pennall or Pennell - with his Scottish birth and death records both spelling it as Pennal. Born in 1870 in Liverpool according to football records (but see the contribution from Tony Onslow below), Pinnell started his career with two years at Everton and another at Preston North End, primarily as a reserve in a number of outfield positions. 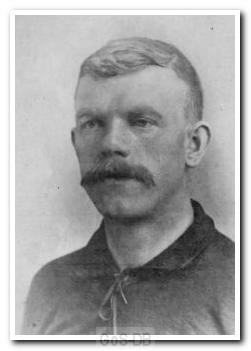 He moved on to Chorley Town in 1894, becoming their first-choice goalkeeper over the following four years. Although not famed for his playing career, a photograph of Pinnell in his Chorley strip is one of the most iconic images of Victorian-era football. In 1898 he joined Burnley, and then moved on to New Brompton. Although records are not conclusive, it seems that Pinnell was playing local football for Oreston Rovers when he moved to Home Park in 1903, as back-up for Jack Robinson. He was released at the end of the club's first professional season and, it seems, returned to play for Oreston. I am an Everton fan who, like yourself, loves my team. I have written and researched the full hit on Archie, who despite Everton's club records, was born in Scotland and not Liverpool. I have submitted my research to the ToffeeWeb website and am happy to replicate it here. The official club records claim he was born in Liverpool but Archie was, in fact, born in the Ayrshire coastal town of Stevenson where his father worked as a coalminer. The year was 1870. The 1891 census then reveals that the Pinnell family had moved to the north Lanarkshire town of Blantyre where Archie was reported to living, with his parents and three brothers, at 7 Bairds Row and he was working, along with his father and elder brother, at a local colliery that was owned by William Baird. It was around this time that Archie was spotted, by an Everton scout, while playing junior football with Blantyre Victoria and it was from this club that he was offered the opportunity to join Everton in September 1891. He accepted the proposal and began a great odyssey that was, eventually, to bring him back in his native Scotland. Archie Pinnell made his debut for Everton Football Club on 25 October 1891, in a specially arranged reserve team fixture against Accrington that was played at Anfield. He played at centre forward and helped the side to a 2-0 victory. He then settled in the club's Reserves side in the Combination, where he played out the rest of the season. These were however, troubled times at Everton where a group of directors, who were in dispute with the club's president, decided to leave Anfield and set up home at Goodison Park. Archie elected to join them on their exodus across Stanley Park. There had been, since his arrival in England, an improvement in his play and this resulted in Archie making his first team debut on 17 September 1892, against Blackburn Rovers at Ewood Park. He played as goalkeeper and game ended in 2-2 draw. Archie kept his place in the first eleven and made his home debut, next Saturday, in a 6-0 victory against Newton Heath on a Goodison Park ground that was still taking shape. It had been a heavy defeat for the Manchester club but they had a chance to gain their revenge when the two sides met again, in a Football League match three days later. Archie was again selected to play in goal. The Newton Heath club played their home games on North Road close to the large Lancashire & Yorkshire railway depot from which they derived their name. It was dull and overcast day when Archie took up his place in the Everton goal in front of a crowd of 3,000 people. The home side then took an early but Fred Geary equalised for Everton. The match had been in progress for 75 minutes when the referee, a Mr Fitzroy-Norris, claimed it had become too dark for him distinguish the aspects of play and promptly abandoned the game leaving everybody, quite literally, very much in the dark. (The match was later replayed and Everton won 4-3.) Archie then took his place back in the Combination side before returning to make his third, and final, appearance for the Everton first eleven on 8 October 1893. Rain was falling in torrents when he took up his place beneath the Everton crossbar to face the Football League Champions, Sunderland. The Wearsiders had earned themselves the title of “team of all talents” and would again, at the end of the season, retain their title. The large Goodison Road side had yet to be developed but the other three sides of the ground were now covered, enabling a capacity crowd, around 20,000 in number, to pay record gate receipts to watch the match. The visitors then commenced to give Archie a torrid time in the Everton goal and he was beaten on four occasions as the visitors won the game by 4 goals to 1. He was dropped after the game but still enjoyed the rest of the season by playing in an Everton second eleven who were scoring goals for fun. They won the Combination, having scored 102 goals in 22 matches, with several weeks to spare. Nevertheless, Archie left Everton, at the end of the season, and joined Preston North End. The Scotsman spent one season at Deepdale, playing just one game, before accepting an offer to play Lancashire League football with Chorley. During the four seasons he spent there an iconic picture was taken, depicting the Victorian footballer, of him, sitting in the goalmouth on the club's home at Dole Lane. (This may be seen on Wikipedia.) Archie later played 5 league games for Burnley before joining the great trek south to sign for Southern League side New Brompton, where he made just two appearances. Archie Pinnell then joined the Scots Guards where he lists his brother William as being his next of kin. He then fought, with his regiment, in the Boar War before suddenly reappearing, in 1903, playing football for a Devonshire amateur side with the name of Oreston Rovers. Archie was then approached by the former Everton player/secretary, Frank Bretell, to join him at Southern League side Plymouth Argyle where he had just been appointed to the role of manager. He first kept goal for Plymouth on 25 December 1903 against Reading and played his final game on 29 February1904 against Tottenham Hotspur before ending his playing days back with Oreston Rovers. He later returned to Blantyre where he took up his old job as a coalminer. On 15 July 1915, Archie, now 39 years old, married a widow lady named Agnes Reynolds in Glasgow. The marriage certificate reveals that Agnes is a Hospital Nurse and that she has a home in Blantyre. Archie then celebrated the occasion by re-joining the Scots Guards for his army record tells us he was placed in charge of a Chinese Labour Corp in France. He survived World War One and returned to Blantyre where he ended his working life as a coalminer. This former Everton goalkeeper, having survived his wife, died at a nursing home in the Scottish town of Hamilton. He was 78 years old. Archibald Pennell did indeed marry Agnes Reynolds in 1915. They had had a relationship over many years and in fact had a son born "out of wedlock" in 1895. He was christened Norman Scott (Agnes Reynolds maiden name was Scott) and was killed in action in France on Thursday 25th July 1918 aged 23. On the certificate on the Commonwealth War Graves commission website he is shown as the son of Archibald and Agnes Pennell. Agnes subsequently married a William Reynolds. Archibald and Agnes marriage was suspect in that they married in 1915 with Agnes describing herself as a widow. However I know her first husband William was alive in 1918. But in wartime especially the First World War things must have been so difficult. How do I know this? Agnes (Reynolds) Pennell was my Great Grandmother. Kind Regards, Geoff Reynolds.